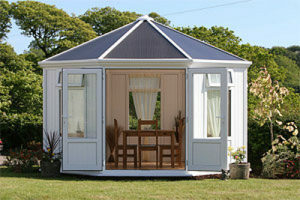 Garden rooms or garden lodges are wonderfully practical to use as an office, study or simply just a leisure room. There are wonderful designs available; some low price conservatories, garden rooms or sun-rooms can be installed even without the need for planning permission. A garden room looks best with a set of French patio doors. They open outwards so they don’t interfere with internal space and look very classy. If you have ever thought of increasing the space in your property this could be a perfect solution; Properly self-contained and secure, they offer an attractive, weather proof, draught free, independent extension to any family home – a new low maintenance living space with some design options that could be installed & completed in a day or two. The entire process from selecting your favourite look & design, right through to the completed installation can be made straight forward. Installers can offer a complete project managed solution from start to finish, making the whole process as easy and stress-free as possible. These independent buildings really are a great way to expand your living space; no longer just a “shed”, modern styles range from the simple to the grand. High-end examples offer “Scandinavian” type lodges, with wood clad sides, bi-fold doors or sliding doors – even air conditioning. Use yours as an office, study or studio, play room or just for relaxing. Buying Conservatories or Extending Your House – Conservatories or Re-modelling? Which is the best option for your family home, adding conservatories or building traditional extensions? The decision can be subject to, not only personal preference but also financial considerations.